I used a store bought sauce and added my own spices to it so that saved a little time. If you do go with a store bought sauce just watch the sugar content! I like San-J Teriyaki sauce and marinade. It's super tasty and only has 3g of carbohydrate. Or, if you have some extra time, make your own sauce! In a large pan cook ground turkey until cooked through. Add frozen veggies and cover. Cook over medium heat, stirring occasionally, until veggies are thawed and crisp tender. Add seasonings and sesame seeds and continue cooking 2 minutes or until garlic is fragrant. 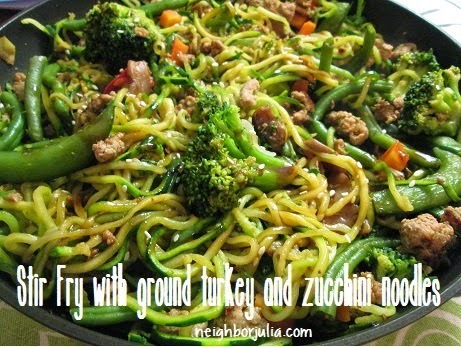 Toss with cooked zucchini noodles and teriyaki sauce. Cook until sauce is heated through and enjoy!